Yesterday I ran what felt like a million errands. From Target to Anthropologie to West Elm, I was Christmas shopping and sneaking things into my cart for our home too. Over the weekend we purchased new furniture for our living room area outside our kitchen and I’m THRILLED to start decorating again after a crazy few months of travel and work. Finally the Ambitious Home is coming together. With jars full of freshly baked cookies on my countertops, obviously. Both Lee and Katie are in town so we can work on stuff for the Healthy Glow.Co launch. I’m super excited and have promised to bake some cookies for them. 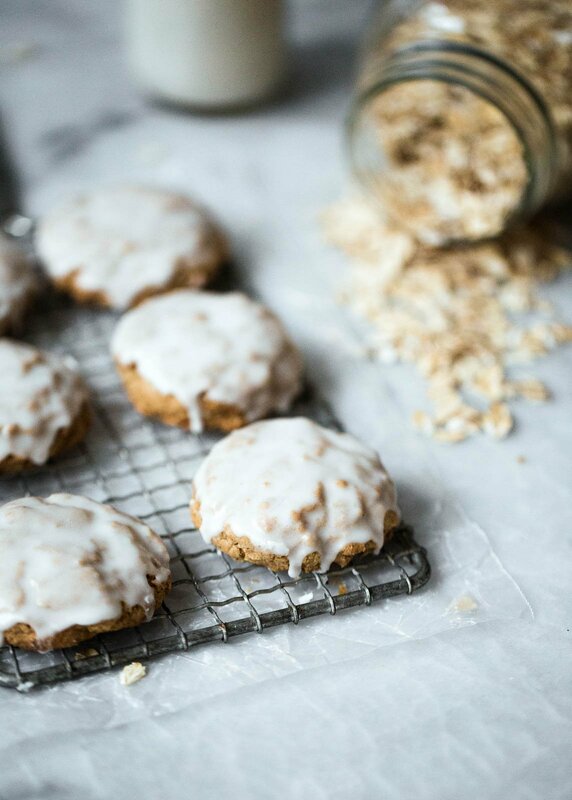 These brown butter oatmeal cookies just might have to be the ones. There’s something I absolutely love about an oatmeal cookie. They’re chewy, hearty and damn tasty, Especially when you add a little brown butter to the mix; the toasted caramel-like flavor takes these oatmeal cookies to the next level. I find them absolutely perfect when paired with a hot cup of coffee. 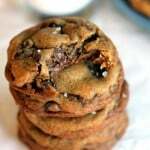 A note on oats: You can use quick oats in this recipe if you want a thinner cookie. If you prefer the slightly thicker ones, regular oats are the way to go. Flour power: Feel free to sub all purpose flour for whole wheat pastry flour. I used whole wheat pastry because I love the flavor it gives the cookies. I haven’t tested these with any other flour though. If you want to make them gluten free, I suggest trying out an all purpose GF flour. Watch the video & see how to make the cookies right here! I’ll see you back here tomorrow for another delicious recipe. xo! If you make this, be sure to leave a comment below, or upload a photo and tag #ambitiouskitchen on Instagram. 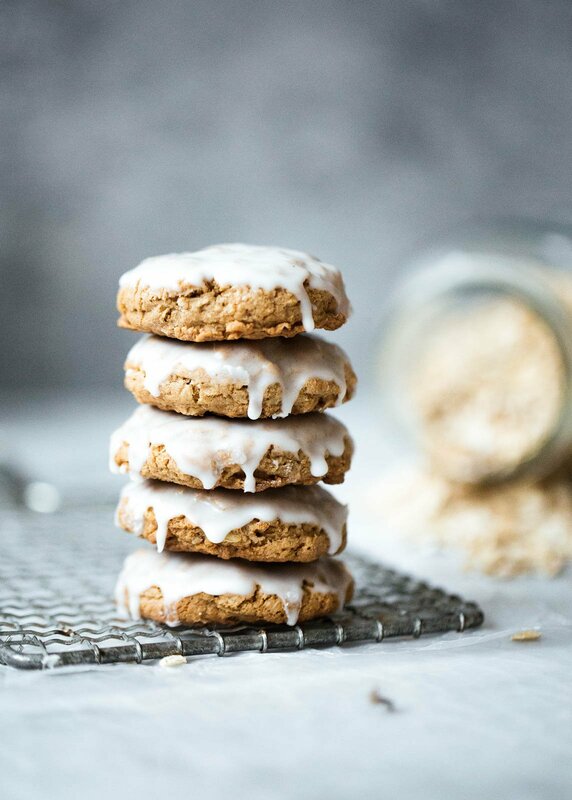 Beautiful chewy cinnamon brown butter oatmeal cookies that are slightly crispy on the edges and chewy in the middle! 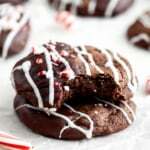 These wonderful cookies are finished off with a scrumptious icing. Melt butter in a medium skillet or pan over medium heat. After a few minutes, the butter will begin to crackle and then foam. Make sure you whisk consistently during this process. After a couple of minutes, the butter will begin to brown on the bottom of the saucepan. Continue to whisk and remove from heat as soon as the butter begins to brown and give off a nutty almost hazelnut-like aroma. Immediately transfer the butter to a bowl to prevent burning but make sure you scrape all the yummy brown bits from the pan; this is where the flavor is! Set brown butter aside to cool for 5 minutes. With an electric mixer, mix the brown butter and sugars until well combined, about 1 minute. Beat in the egg and vanilla until smooth and creamy, about 1 minute. Add the dry ingredients: flour, oats, baking soda, cinnamon, nutmeg and salt; beat on low speed until just combined. Use a medium cookie scoop or your hands to grab about 1 large teasing tablespoon of dough. Drop on prepared cookie sheet, leaving at least 2 inches of space between each cookie. Bake for 10-13 minutes or until golden brown on the edges. Allow cookies to cool on the cookie sheet for a few minutes before transferring to a wire rack to finish cooling. 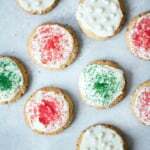 When cookies are baking, you can make the icing: Add powdered sugar, vanilla extract and milk to a medium bowl and mix until smooth and no visible lumps. Once cookies have cooled a bit, spoon two teaspoonfuls of icing onto each cookie and spread out a little, then return to wire rack to let the icing harden. Makes about 2 dozen cookies (24). These make a wonderful base cookie to add to! Simply leave off the icing and add chocolate chunks or chips. Dried cranberries, raisins or white chocolate would also be fabulous. 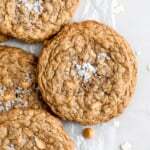 45 Responses to "Old Fashioned Iced Brown Butter Oatmeal Cookies"
Beautiful! This week is just going to be amazing, Monique! I think I’m going to try them gluten-free, we will see how they turn out! these sound delicious and super cozy with the oats and brown sugar and spices! and even better that the icing hardens, because otherwise i can imagine what kind of a nightmare storing these would be without stacking them. Mmm, those look amazing! 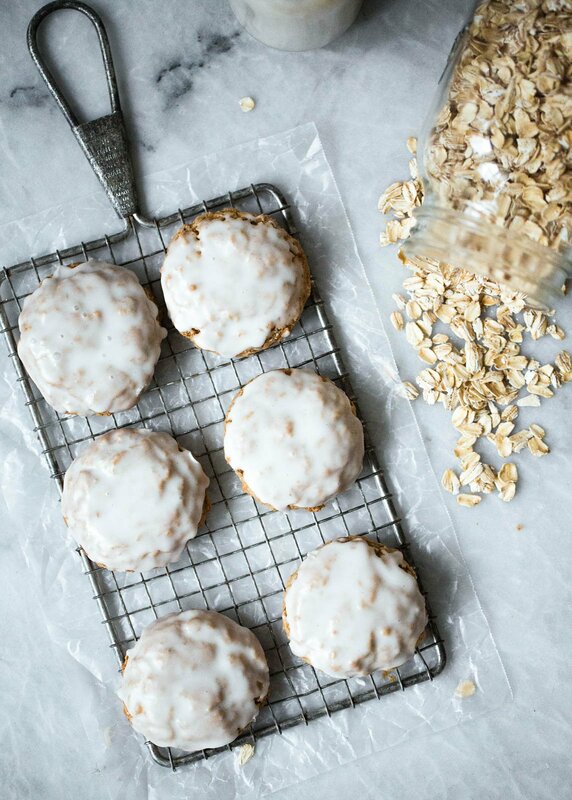 I love anything with brown butter, and I bet that with the hearty oats these cookies are almost like scones. So that makes them acceptable to eat for breakfast, right?! These cookies look amazing. One question dark or light brown sugar? I notice in the video you have nutmeg in the recipe but it does not appear in the print version. They look delish!!!! Hmm. That’s weird. The video said nutmeg, the recipe had cloves. I looked at the video and there were no cloves in it. Maybe a simple mistake. Just made these today. Amazing!! Great spice and the brown butter is awesome. These look really good! I made a few interesting snacks before that I found at http://bit.ly/FreePaleoPack but other than that I’m new to gluten free cooking. These seem really easy to make, even in a hurry. (which is important for a newbie) Thanks! For the spices is it nutmeg or cloves or both? The video shows nutmeg, the recipe shows only cloves. 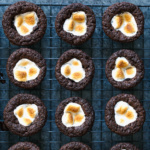 Thanks can’t wait to make these! How much cloves? It’s not in the ingredients list. I actually made these with the 1/4 tsp cloves and not the nutmeg. They turned out really great with that little bit of spice. I made a double batch and took them to the volunteers at my church. I make the cookies small so that was about 120 cookies and they were gone by the end of the morning. Everyone loved them. monique. i’ve made legit 6 batches of these cookies & have included them on my cookie plates that i distribute to friends & family every year. 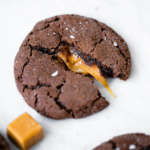 not only do i think they’re AMAZING (like omg, perfect chewy texture & the brown butter adds such complexity! ), but everyone i’ve given them to has RAVED about them. like, “best cookie i’ve ever eaten” raving. this recipe is serious business. LOVE. these look good – but, I don’t think they are healthy at all with amount of calories and sugar per cookie. I know you don’t claim to be, but still. Hi! 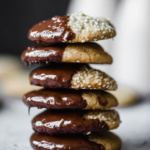 You’re right that these cookies aren’t necessarily “healthy,” but I’m a firm believer in being able to enjoy everything in moderation – including indulgent treats like this one 🙂 The majority of my recipes have a healthy kick to them, but I do like to bake up some indulgent goodness every so often! It’s a cookie not a carrot. Would it be possible to make the dough the night before and keep in the fridge to bake the next day? You could leave them out if you wanted, but they help give the cookies their distinct flavor! I made these the other night and they are DELICIOUS! My only question is, my cookies didn’t turn out quite as thick as yours – any tips for that? Thanks!! So glad you liked them! I’d recommend rolling the cookie dough balls a bit “taller” if that makes sense, and/or chilling the dough a bit beforehand. I just made these and they are delicious. The texture is absolutely perfect and the brown butter makes them special. I used 1/2 old fashioned oats and 1/2 quick oats mostly because I couldn’t decide, lol. The only adjustment I made was to double the salt since you call for unsalted butter and 1/4 tsp didn’t seem quite enough – this is mostly personal preference, as I always think cookies are better with plenty of salt. Are these cookies freezer friendly?